Montana Dakota Utilities Co. has filed for a natural gas rate increase. The utility is asking for an overall 6.4 percent increase. For residential customers, the increase would be 9.5 percent. "For a residential custimer, it would be about $5.15 a month," said MDU spokesman Mark Hanson. "What we're looking to do is recover costs for quite a bit of investment in our natural gas facilities, as well as technology upgrades." Hanson says some of those upgrades benefit customers directly. Members of the North Dakota Petroleum Council spent the past three days in Grand Forks as part of their 32nd Annual Meeting. Much of the discussion focused on how to reduce the flaring of drilling by-products and turn them into a value-added product. Prairie Public's Todd McDonald reports. 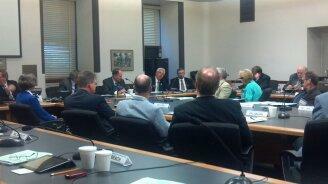 The state Industrial Commission is starting an in-depth discussion on reducing natural gas flaring in the Bakken. Around 30 percent of the gas is flared. State mineral resources director Lynn Helms will be discussing the Industrial Commission's goals with industry representatives at the North Dakota Petroleum Council's meeting in Grand Forks. "They're pretty simple goals," said Helms. "Number one, reduce the volume of gas flared. Number two, reduce the number of wells flaring. And number three, reduce the duration for which those wells flare." The Public Service Commission is looking at the requirements for decommissioning wind farms. When the Legislature passed wind farm laws in 2003, it required the companies to file decommissioning plans with the PSC. And lawmakers said after ten years, the Commission could require companies to have bonding in-place for the turbine removal. That’s what the PSC has been discussing. The chairman of the US Senate Energy Committee says he understands the need for infrastructure – especially pipelines – in western North Dakota to get oil and natural gas to market. The fund – as proposed by the Legislature and approved by the voters – sets aside 30 percent of oil and gas tax collections in a permanent fund – which can’t be touched until at least 2017. Under normal circumstances, the Public Service Commission holds hearings on proposed projects – like natural gas pipelines. In 2008, Hiland Operating, LLC built a 6.5 mile natural gas line in Divide and Burke Counties. It did so without a permit. "They thought it was a gathering line," said Public Service Commissioner Julie Fedorchak. "Under the definition, it does not require a permit. But it's clearly a transmission line." State Mineral Resources director Lynn Helms says he’s convinced the federal Bureau of Land Management will be adopting new rules on hydraulic fracturing. Helms says while most of the rules duplicate what North Dakota has already adopted – there are some others that could slow down the federal permitting process. "It's going to impact development on the National Grasslands and on the Ft. Berthold reservation," Helms said. "It's going to create additional workload and paperwork." Helms says BLM has also lost a number of staffers. "We've reached our cruising altitude. So it's safe to get up and walk around, but you really should stay in your seat with your seat belt fastened, 'cause there will be turbulence." That’s how state mineral resources director Lynn Helms describes the current activity in the Bakken. In his monthly “Director’s Cut” report, Helms says June oil production set a new all time high at 821,415 barrels a day. However, that was below his forecast. Helms says the reason: load restrictions on the roadways were in place until mid-June. 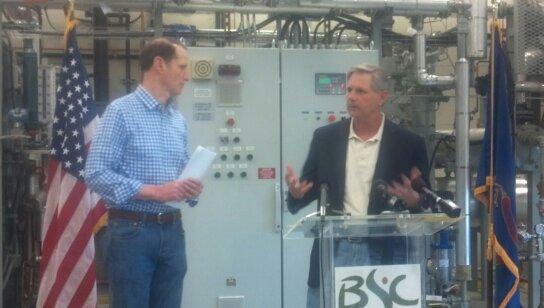 The president and CEO of Minnkota Power Cooperative says the use of what’s called “Cy-Clean” at the Milton R. Young power plant near Center has helped reduce some of the plant’s emissions – especially in terms of mercury. CyClean technology uses combustion additives that are added to the lignite coal before it’s burned in the boiler. Minnkota CEO Mac McLennan says so far, the results are promising.